Dubai Airport Freezone Authority (DAFZA) recently held a series of seminars in South Korea with the Korean business community as part of its continuing initiative to facilitate trade relations among foreign business communities worldwide and further highlight its latest business developments. 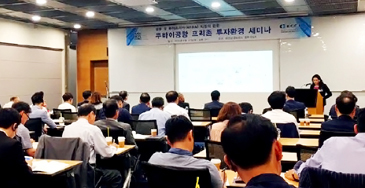 The seminar was held in partnership with the Korean Chamber of Commerce and Industry (KCCI). Jamal Bin Marghoob, Director for Marketing and Corporate Communication, DAFZA led the delegation in a series of business meetings and seminars about the Freezone’s growth and the various industries that have expanded in the community. The DAFZA delegation further noted that the visit aimed to boost foreign investments from South Korea, which currently enjoys a robust trade relations and investments with Dubai and the UAE. The Freezone continuously attracts global investors thanks to its many key incentives, including 100 percent tax exemption and foreign ownership; zero currency restrictions; business-friendly regulatory environment; employee sponsorship; a single-window convenience for administrative services; round-the-clock customs services and rapid cargo clearance; and dedicated logistics services and assistance.